Acme Armature Works Inc. of Sheboygan, Wis. is set to make its first-ever appearance at the Sheboygan County Chamber of Commerce Business Expo Monday, April 16 at the Blue Harbor Conference Center in Sheboygan. The popular business expo event, which runs from 3-7 p.m., will showcase many of the area’s top companies in a wide variety of fields and areas of expertise. The biennial event drew over 500 people to the Blue Harbor Conference Center in 2016. The Acme Armature Works Inc. booth will include electric and servo motor displays, as well as samples of services and repair work, along with an array of promotional materials. 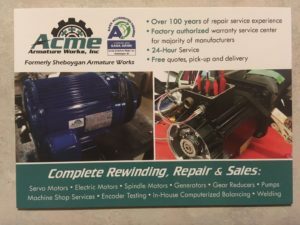 “We will have an electric motor on display and several samples of what we do related to servo motor service and repairs,” Acme Armature Works Inc. Owner Chad Bahrs said. 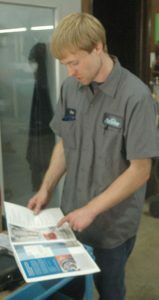 “We will have plenty of brochures and flyers showcasing our various repair services. Since joining the Sheboygan County Chamber of Commerce last year, Bahrs has been impressed with the level of support he has received as a new business owner.